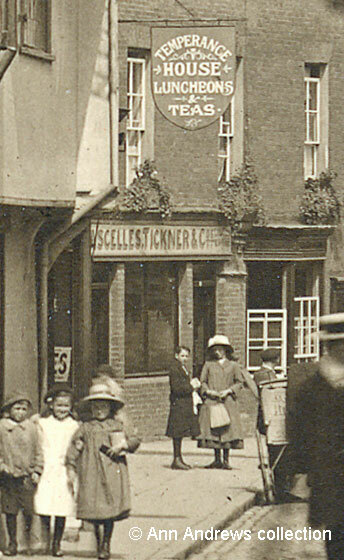 Two early twentieth century images of some of Godalming's oldest properties in Church Street. The street today is not hugely different from the way it looked 100 years ago although the houses are now almost all shops or offices whereas more of the premises used to be dwellings. 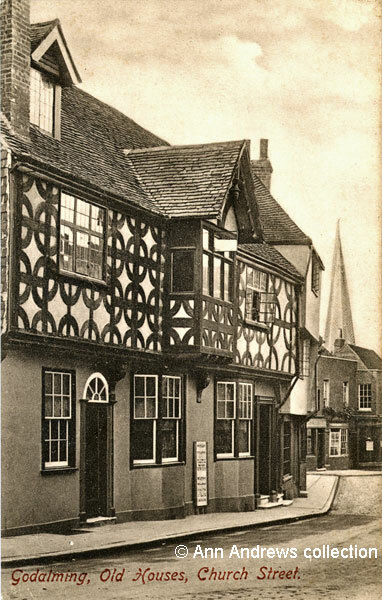 These buildings, which have the distinctive black and white "magpie" patterns in the timber work of the upper floor, are at the "top" of Church Street opposite the Pepperpot / Pepperbox, the corner of which can be seen on the right of the second image. According to the Godalming Trust, No. 1 Church Street was originally called Pleystowe. The building had been rendered at some stage but in 1902 a crack developed in the plaster. The rendering was removed to expose the spectacular timber frames we see today. Although this Grade II listed building had been one property, and is said to date from the early to the mid 17th century, it had been divided into two by 1905. It has a jettied first floor and the first floor bay, which has plain glass in its windows, overhangs the pavement even further. There is a fanlight above the door of property closest to the camera, whereas the door for the other half doesn't have one. Between these two entrance doorways are a pair of bay windows and in both images we can see boards resting on the pavement which are advertising properties - the printed text on them is clearer in the second image. F. A. & A. W. Mellersh were auctioneers and estate agents at 1 Church Street in 1911. Behind the glass of the ground floor bay windows in the photograph above were signs saying the firm are Land Agents and Surveyors. When he passed away in 1915 Alfred William Mellersh was said to have been one of the best known auctioneers in the south of England. He was a director and sometime chairman of Lascelles, Tickner & Co. amongst other concerns. His brother Walter was still there in 1924. Next door, where the three children are standing in the second image, is a three storey, double jettied, house. The building was plaster rendered at the time but this has been removed in the interim and today the beams are exposed. It looks wonderful. It is also Grade II listed but is of slightly earlier date - either late 16th century or early 17th century. Thomas Borer, an auctioneer's clerk, lived at No 3 with his daughter and a grandchild in 1911; the daughter Lillian was still in residence in 1939. The next properties can't be seen from this angle but the sign of 5 Church Street, where Gwendoline Emily Jane Marshall was running a 5 roomed Temperance House, is visible in the enlarged image below. She provided luncheons and teas but no alcohol would have been consumed here. At No 7 and 9 were the Busby family. Of the males in the household one was a baker, another a butcher, the third was a labourer and the final male was a saddler. In1939 the family's shop was still run as a "butchers &c". The Holdens were at no11. Benjamin was a cricket professional who worked at Charterhouse whilst his wife Annie Elizabeth ran the grocery business, later a confectioners. By 1939 Benjamin and Elizabeth were tobacconists and general dealers. A little further along is what was then the Corn Meter public house, where the road comes in from the left. This road was Hart's Lane, now part of Mint Street. The Corn Meter is best shown in the enlargement of a section of the second image immediately below. on the right which may say Corn Meter. The beerhouse keeper of the Corn Meter at the time was Jesse Henton and he and his wife had already run the beer house for a number of years. However, ten years earlier the landlord was John Golds. Elizabeth Henton died in 1910 and Jesse moved away to the Petworth area; he died there in 1917, aged 83. At the beginning of 1914 "considerable interest, if not excitement, was caused by a chimney fire at the Corn Meter Inn ... . The flames, which belched forth from the chimney to a height of several feet, were put out by P.C. Steer with the assistance of Alderman W H Pilcher J.P." who got a ladder from the Pepperpot (the old Town Hall), climbed up it and poured water down the chimney. A few days later James H. Ketchell, the landlord, was summoned for allowing his chimney to catch fire. The police constable gave evidence that the chimney had been swept three times in the previous 18 months so the case was dismissed. The Corn Meter had stabling for four horses on Cow Lane at the rear of the public house. In 1915 there was another outbreak of fire, this time in the stables. At the time there were four horses, belonging to the Royal Field Artillery, stabled here. Both soldiers and police arrived quickly at the scene, burst open the stable doors and doused the smouldering straw having first rescued the horses. A soldier called Private House collapsed with smoke inhalation but littler damage was done. Once again, a few buckets of water were used and the fire brigade, although summoned, were not needed. In 1939 the "Corn Meter Hotel" was in the hands of Cyril L. W. Pearce. It survived as a hostelry until 1956 and it was then converted into an ironmongers; it remains a specialised, family owned, DIY store. Lastly, the empty shop next door to Corm Meter in the top Edwardian picture, with the white sign in the window, had been a draper's shop and then became Allens. In the second picture the sign above the window reads H. Moore. 1. "Godalming, Old Houses, Church Street" published by F. Frith & Co. Ltd., Reigate, No. 54684. Not posted but card dates from 1905. Information from either or both the 1901 and the 1911 census, which are available on Find My Past. "Surrey Advertiser", 13 November 1915. "Kelly's Directory of Surrey" (1924) Kelly & Co. Ltd, London. The 1939 Register, taken in September of that year, is also available on Find My Past. Note that the details of anyone who was still alive when it was first made available to the public are blocked out. The 1891 census. Mr. Golds is not mentioned in the "Kelly's Directory" for that year. "Surrey Advertiser", 24 January 1914 and "Surrey Advertiser", 28 January 1914 (Godalming Borough Bench). "Surrey Advertiser", 20 January 1915. Fire at Godalming Stables. Military Horses in Danger. 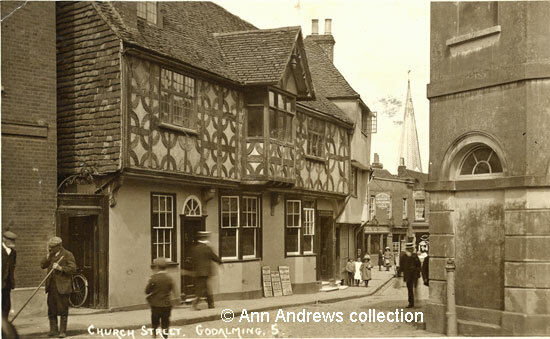 See: Godalming, Church Street, 1903.